Since this communication is two-way, with peptides understanding the "language" of technology and vice versa, their approach essentially enables a coherent bioelectronic interface. "Bridging this divide would be the key to building the genetically engineered biomolecular solid-state devices of the future," said Sarikaya, who is also a professor of chemical engineering and oral health sciences. His team in the UW Genetically Engineered Materials Science and Engineering Center studies how to coopt the chemistry of life to synthesize materials with technologically significant physical, electronic and photonic properties. To Sarikaya, the biochemical "language" of life is a logical emulation. "Nature must constantly make materials to do many of the same tasks we seek," he said. The UW team wants to find genetically engineered peptides with specific chemical and structural properties. They sought out a peptide that could interact with materials such as gold, titanium and even a mineral in bone and teeth. These could all form the basis of future biomedical and electro-optical devices. 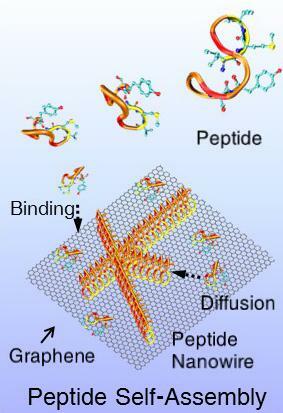 Their ideal peptide should also change the physical properties of synthetic materials and respond to that change. That way, it would transmit "information" from the synthetic material to other biomolecules — bridging the chemical divide between biology and technology. In exploring the properties of 80 genetically selected peptides — which are not found in nature but have the same chemical components of all proteins — they discovered that one, GrBP5, showed promising interactions with the semimetal graphene. They then tested GrBP5's interactions with several 2-D nanomaterials which, Sarikaya said, "could serve as the metals or semiconductors of the future." "We needed to know the specific molecular interactions between this peptide and these inorganic solid surfaces," he added. In parallel, Sarikaya's team modified GrBP5 to produce similar results on a semiconductor material — molybdenum disulfide — by converting a chemical signal to an optical signal. They also computationally predicted how different arrangements of GrBP5 nanowires would affect the electrical conduction or optical signal of each material, showing additional potential within GrBP5's physical properties. "In a way, we're at the flood gates," said Sarikaya. "Now we need to explore the basic properties of this bridge and how we can modify it to permit the flow of 'information' from electronic and photonic devices to biological systems." This is the focus of a new endeavor funded by the National Science Foundation's Materials Genome Initiative. It will be led by Sarikaya and joined by UW professors Xiaodong Xu, René Overney and Valerie Daggett. Through UW's CoMotion, he is also working with Amazon to cross that bio/nano divide for nano-sensors to detect early stages of pancreatic cancer.